This book was out of the realm of comfort for me Folks. It is not to say it was not well written but the concept was just a little far out for me! 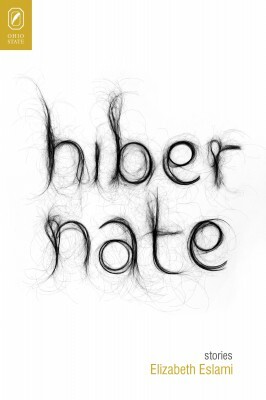 Winner of the Ohio State University Prize in Short Fiction, HIBERNATE is a collection of eleven stories each featuring an intensity in situation and feelings, reflecting human resilience in the face of complex circumstances as far as I can tell. The synopsis enticed me as the cover did not, and I struggled to appreciate the writer's outpourings. The author clearly has a personal way to express herself, and the skills to convey her emotions. Entertaining it was not, different definitively and perhaps readers might well appreciate the angle. And that Folks, is the very best I can do. Note: Due to thematic contents including violence and strong words, suitable only for mature readers. Rating: I recommend readers to check out other reviews. Elizabeth Eslami is the author of the forthcoming story collection, Hibernate, for which she was awarded the 2013 Ohio State University Prize in Short Fiction, as well as the novel Bone Worship (Pegasus, 2010). 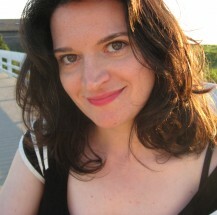 Her essays, short stories, and travel writing have appeared most recently in The Rumpus, The Literary Review,Michigan Quarterly Review and The Sun, and her work is featured in the anthologies Tremors: New Fiction By Iranian American Writers, The Weeklings: Revolution 1, and Writing Off Script: Writers on the Influence of Cinema. She also serves as senior prose editor for Tupelo Quarterly. Elizabeth Eslami currently teaches in the MFA Program at Manhattanville College. Disclaimer: I received a copy of this book courtesy of SPARKPOINT STUDIO as part of this book promotion. I am disclosing this in accordance with the FTC 16 CFR, Part 255 'Guides concerning the use of endorsements and testimonials in advertising. I was not asked to write a positive review and all opinions expressed are entirely my own. 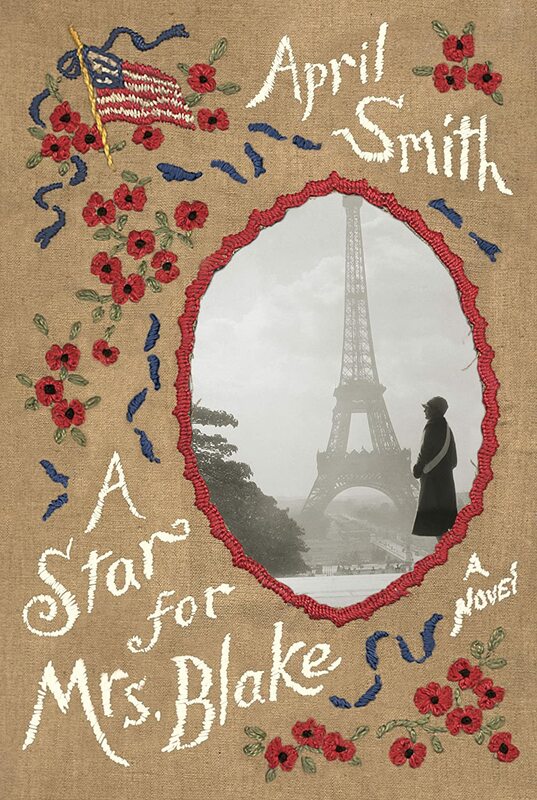 In April Smith's 'A Star For Mrs. Blake', we discover anew an almost forgotten part of history! Thirteen years after the Armistice, the US Armed Forces organized pilgrimages of Remembrance for Mothers who lost their sons during the Great War. only 6, 693 made the journey to Verdun. April Smith wove a brilliant novel showcasing 5 women of very different backgrounds and the West Point officer and Army nurse who accompanied them on the S.S. Harding for a last farewell to their loved ones. With charismatic flair, the author gives an accountant of each fictional character's feelings as they make this emotional journey. First class accommodations are almost dazzling and even perplexing for some of the Mothers, but despite their differences, they share one bond: see where their sons have fallen. April Smith took care to blend the fictional and the fact based events with a clarity most readers will appreciate as mothers themselves. In 'A Star For Mrs. Blake' you will laugh whole heartily, shed a few tears and feel compassion for these women facing their sons' last resting place but also their pride at their ultimate sacrifice for the country each believed in! This is my first novel by this author and I appreciate her keen descriptive for highlighting a poignant event and fascinating diorama of one such pilgrimage across 1930's France. You almost feel there! I can't wait to check out her other books! "Yes, I'm the same April Smith who writes the FBI Ana Grey Mystery/Thrillers, but now I've taken a new direction -- a foray into historical fiction with my latest novel, A STAR FOR MRS. BLAKE. I've wanted to tell the story of the 1930s Gold Star Mothers pilgrimages to Europe for twenty-five years, but nobody was interested, so I wrote it on spec. They say to follow your heart, right? I wrote NORTH OF MONTANA, the first Ana Grey novel, on spec, too. I grew up in the Bronx, where the Kingsbridge Road Branch public library above a dry cleaners was the center of my universe -- which many years later became Los Angeles and writing for television, garnering three Emmy award nominations and two from the Writer's Guild. Now I'm happy to be back home: still writing scripts, but firmly and forever in the world of books." Note: A library loan reflecting my opinion only! Thank you Anna for suggesting this title! This looks like a fun and video that would be great to watch with my grandchildren. Have a great week. I will contact you shortly to confirm your postal address! Moscow, 1956. A society trying to recover from a time when the police were corrupt and the innocent arrested as criminals. Detective Leo Demidov, former Secret Police Officer, is forced to ask whether the wrongs of the past can ever be forgiven. Trying to solve a series of brutal murders that grip the capital, he must decide if this is savagery or justice. Quickly it becomes apparent that Leo himself - and his family - are in danger from someone intent on revenge. Desperate to save those he loves, he is offered salvation from an unexpected source - and at a terrible price. From the streets of Moscow in the throes of political upheaval, to the Siberian gulags and the Hungarian uprising in Budapest, The Secret Speech is a breathtaking novel that confirms Tom Rob Smith as one of the most exciting authors writing today. A testament to the endurance of thousands of dissidents, Solzhenitsyn's 'The Gulag Archipelago' fascinated me as a youngster and a copy traveled with me throughout thousands of miles. Fictional works such as Kate Furnival's 'The Red Scarf' holds similar appeal me so when I spotted Tom Rob Smith, I anticipated a good novel. Based in part on the 25th February 1956 'Secret Speech' delivered by Nikita Khrushchev, the novel by the same title is Tom Rob Smith's second. The first chapter of The Secret Speech features the planned destruction of a centuries old church in 1949 Moscow, its priest now a Professor at a nearby University under the new regime, hiding in the crowd. Most gawkers congregate to satisfy their curiosity, some because of their political inclinations, others to mourn the loss of a treasured religious edifice. Amongst them is an agent for the State, as expected under the regime, milling to gauge the crowd's reactions. Unbeknownst to Lazar the priest, his young prodigy Maxim and one of his University student, is not only a member of the dreaded MGB, but his wife's lover. Betrayed, husband and wife are arrested as dissidents. 1956: Maxim whose real name is Leo Demidov has left the secret police. His wife and two adopted daughters are all that matters to him as he tries to forget his own role in the old regime's purges. But the past comes to revisit when his oldest daughter is kidnapped and soon the former MGB agent finds himself in the middle of a series of brutal murders, the retribution for the denunciations and torture of hundreds of innocents. Desperate to hold on to the family he has created for himself, Leo finds himself in pursuit and amid the impending invasion of Hungary. Best described as a 'sensational thriller' set behind the Iron Curtain throughout the Cold War, it provided neither entertainment or seemed historically accurate. None of the characters profiles grabbed me as strong and the hackneyed plot line following Leo from Moscow to the horrors of Gulag Kolyma, back to Moscow and on to Budapest as Hungarians citizens vehemently resist the Russian advances seemed implausible. Note: Due to thematic contents, violence and strong language, recommended for mature readers only. 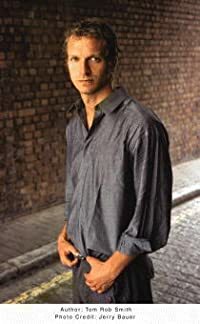 Tom Rob Smith graduated from Cambridge University in 2001 and lives in London. His first novel, Child 44, was a New York Times bestseller and an international publishing sensation. Among its many honors, Child 44 won the ITW 2009 Thriller Award for Best First Novel, The Strand Magazine 2008 Critics Award for Best First Novel, the CWA Ian Fleming Steel Dagger Award, and was longlisted for the Man Booker Prize. Note: This novel is part of my personal library and reflects only my opinion. I read a fair share of books and I agree their substance shaped me even when I forgot some of their titles (rated under Senior Moments). I rarely forget a book though! Once read, I easily recognize a title once I read the synopsis. It is believed the content you consume whilst reading says a lot about your interests and intentions. So much that if you analyze the sum of everything you read this past year, it would provide an accurate view of your priorities, concerns, and thus interests and intentions. Startling (not to mention scary) but perhaps accurate! 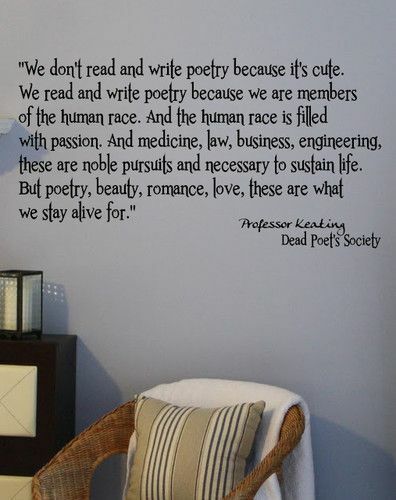 I am more inclined to read prose (novels, short stories, essays and even plays) than poetry. I appreciate the latter though I must be in the mood, or when an author dabbles in both as Shakespeare was wont to do (The Bard felt like a good example). Only this morning I found the above quote (great artwork too!). 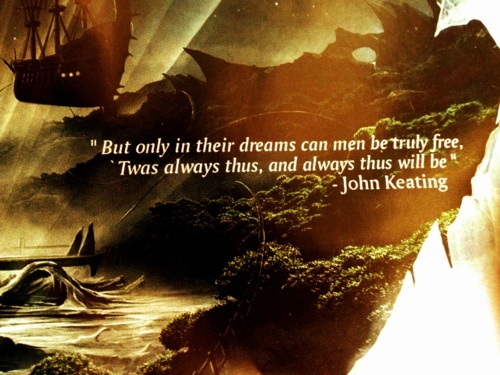 John Keating's thoughts on freedom are in my mind spot on! Pragmatic I might be for many things, but I admit to being also a dreamer as anyone will tell you. To analyze what I read, the object to find out 'Whom am I?' felt like an exercise in futility in the end. There will always be new books to read, styles and subjects to explore, that's what is so wonderful about literature! To pinhole it seemed absurd. I prefer historical fiction to contemporary novels or autobiographies but I am certain I would appreciate more the last two if I only give it a try. Never say never, it might still happen! Historical fiction based on true facts remain my favourite to date. There are enough events in our past that bears weighing and expounding upon in the written form. Sadly, history is determined to repeat itself. We Humans, fail to learn from lessons unlike our furry friends in my mind! What do you read and what does it say about you? Neither matters much if you do not enjoy it! Read! Read! A few lines, a few pages somewhere, sometime, somehow and enjoy those precious moments between you and a good book! 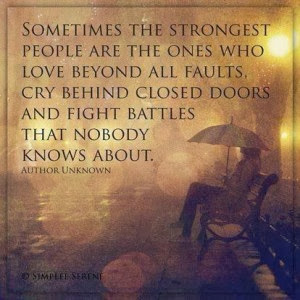 I think the quote above was made for me Folks! 1935. Rose Manon, an American daughter of the mountains of Nevada, working as a journalist in New York, is awarded her dream job, foreign correspondent. Posted to Paris, she is soon entangled in romance, an unsolved murder, and the desperation of a looming war. Assigned to the Berlin desk, Manon is forced to grapple with her hidden identity as a Jew, the mistrust of her lover, and an unwelcome visitor on the eve of Kristallnacht. And . . . on the day before World War II is declared, she must choose who will join her on the last train to Paris. This is a carefully researched historical novel that reads like a suspense thriller. Colette and Janet Flanner are only two of the well-known figures woven into the story. The parts they play will surprise readers. 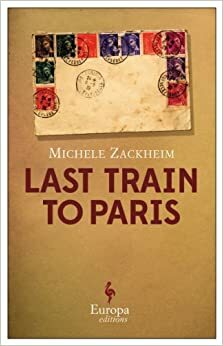 Originally a muralist, Michele Zackheim unveils in Last Train to Paris frame by frame inherent memories of a distant past for one outspoken American journalist, now an octogenarian. In the second half of the nineteen thirties, R. B. Manon was determined to report the impetus leading to an all out war throughout Europe. Known by her colleagues as a free spirit at a time when female reporters were a rarity, particularly as foreign correspondents, she wore trousers, smoked, and drank with the best of them. Her raw reporting was always informative if somewhat abrasive but eventually gained her the respect of the newspapers world. While based overseas, she builds a new life for herself, away from a heartless mother, forging strong friendships yet missing the clean air of Nevada. Half Jewish, R.B. believes herself to be different from other Jews but times are fast becoming dangerous for any but Aryans. Her assignments takes her back and forth between Paris and Berlin and she witnesses firsthand Kristallnacht . Determined that the world knows the truth, she writes her column with a stark eloquence, often dismissing prudence, all the while earning recognition both on the continent and the US. In Berlin she meets handsome but troubled Leo, a Jewish engraver working for the Nazis and thus commence a bittersweet love story as Leo recognizes R.B. naivety. Decades later, a trunk arrives at R.B. 's home located on the East coast containing Pre-war notes and newspapers clippings. 87 year old Rosie known to all as R.B. mentally chronicles the events leading to angst, and heartbreak as she left Berlin for the very last time, recalling her life with only a handful of regrets. The richness of the story can only be experienced through the expert eyes of this talented writer, with its unusual descriptive form. Michele Zackheim blends a single event uncovered in her family's history and leads us to follow a murder and the perpetrator's ensuing trial, eclipsed only by the winds of war as her fictional heroine R.B. chases the next headline! A multi layered woman is revealed in Last Train To Paris, her life stamped by world events and the unforgettable people she met and loved along the way. Michele Zackheim worked as a visual artist before turning to writing. She has shown in numerous museums and galleries. She is also the author of Einstein’s Daughter, nonfiction, and Violette’s Embrace. Also check out an interview with Michele Zackheim (Here) for more on this author! Note: This was a library loan and reflects only my opinion!